This is the first post in a new Transcontinental Series aimed at helping flyers choose the best options while flying coast-to-coast, as well as strategies on leveraging elite status and miles to get the most valuable upgrades possible. Other posts include: United, Delta and Virgin America. Today, we’re starting with American’s recent announcement of new three-class Airbus 321’s that will begin servicing its transcontinental routes between New York JFK and Los Angeles and San Francisco. On Monday, American Airlines announced plans to enhance its fleet with 200 new narrow-body deliveries from both Airbus and Boeing. The most exciting part of the news, however, was that the airline’s new planes will have three classes of service and fully lie-flat seats in both business and first class. 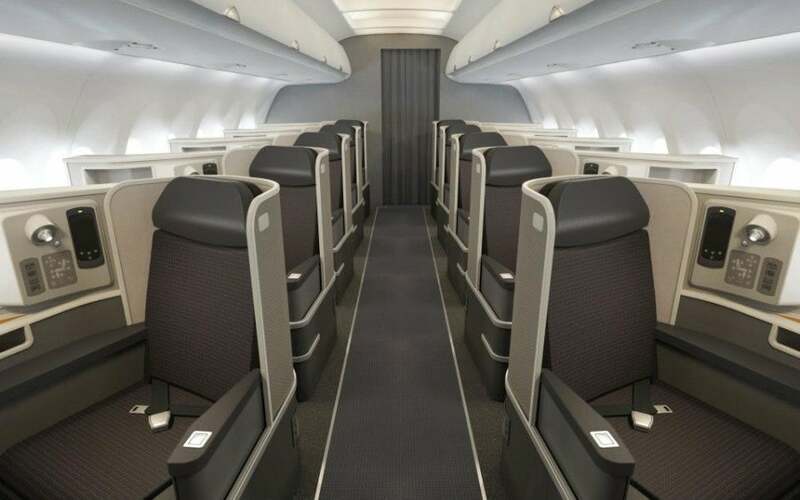 The new business class cabin aboard American’s forthcoming transcontinental A321’s. American will take delivery of 130 Airbus A321’s and A319’s and up to 100 Boeing 737-800’s now through 2017. The new transcontinental planes will be all A321’s, while the others will be used to retire aging planes in American’s fleet. 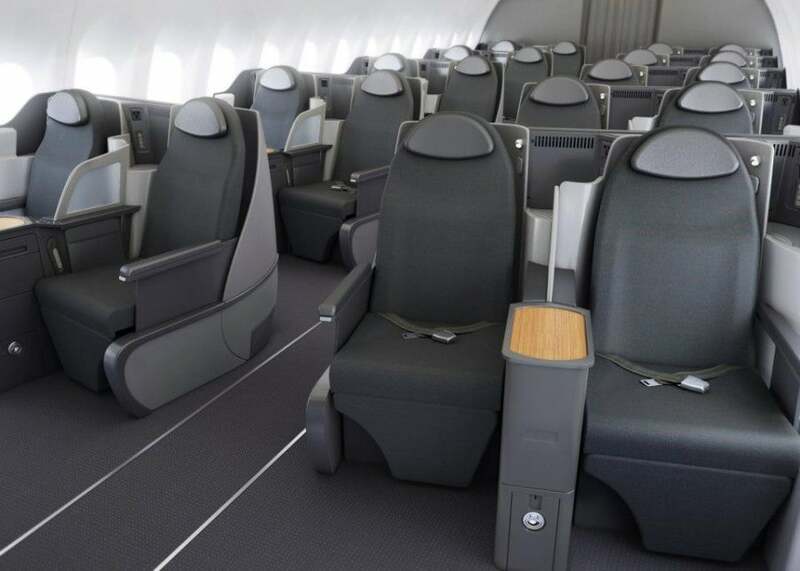 The interiors were designed in partnership with James Park Associates, and are meant to be consistent with the look and feel of AA’s retrofitted 777-200’s and upcoming 777-300’s. The new aircraft will also feature inflight WiFi, in-seat entertainment at every seat (8.9-inch screens in economy) and individual AC power outlets and USB jacks at every seat. The new A321’s outfitted for transcontinental service will replace American’s current 767-200’s used on routes from New York JFK and San Francisco and LAX. The transcontinental A321 first class cabin. The aircraft will have 10 fully lie-flat seats in a 1 x 1 configuration in first class. Business Class will have 20 lie-flat seats in a 2 x 2 configuration, while the Main Cabin will be 3 x 3 with 36 Main Cabin Extra seats. The entertainment systems on these aircraft will also have seat-to-seat chat, live text news and weather updates, 3-D moving maps, airport maps and connecting gate information. Travelers in premium classes will have access to free entertainment on the 15.4-inch screens, and Bose headsets. 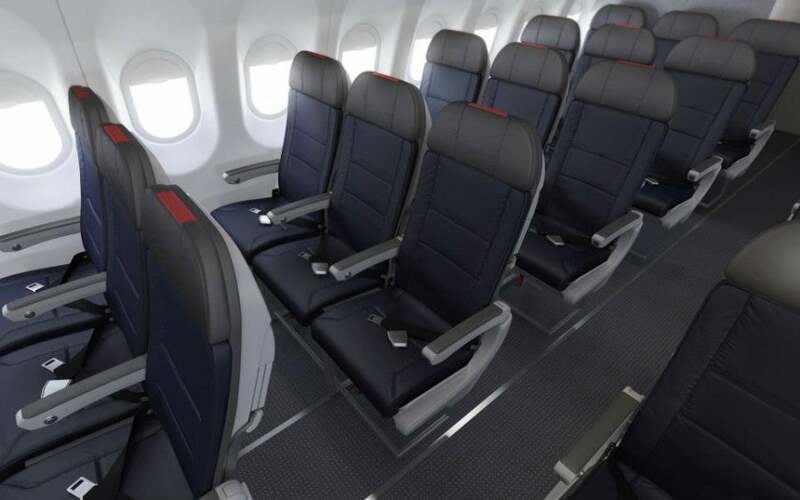 The main cabin seats aboard American’s new planes will have personal entertainment screens and power outlets. The other planes in American’s order will replace the airline’s old Boeing 757-200’s and MD-80’s. All will feature leather seats, WiFi and in-seat entertainment as well, though they’ll only have a two-class configuration. First class seats on these planes will have 12.1-inch screens, while economy will have 8.9-inch screens. Delivery of the A319’s begins July 2013, while the 737’s and 321’s will start rolling out in October 2013 and the second quarter of 2014 respectively. American will upgrade Executive Platinum (100,000 EQM level) flyers starting at 100 hours before departure. Upgrades are prioritized by the time the upgrade was requested (usually at booking), so last-minute flyers are often disadvantaged. As an Executive Platinum, I recently sat in coach on a LAX-JFK flight, so it’s anything but a “sure” upgrade, though American does have more seats to be upgraded into (32 on the 767-200) than Delta (16 on the 757) or United (26 on the 757) so comparatively speaking, AA Executive Platinum members are the elites best positioned for the upgrade. Executive Platinum members also get 8 one-way systemwide upgrades yearly and they can be used to secure the upgrade in advance. These upgrades are good for any paid fare class on any AA flight, so generally they are best used for international flights, though they do come in handy when you don’t want to fork out the extra thousands for transcontinental business class and want to confirm the seat- especially for red-eye flights. Gold (25,000 EQM) and Platinum (50,000 EQM) flyers earn four 500-mile upgrades for every 10,000 miles flown. Those upgrades can be used on the premium routes – upgrading a JFK-LAX itinerary would cost five 500-mile upgrades, since the flight is just under 2,500 miles, but JFK- San Francisco is 2,586 miles so requires six 500-miles upgrades. AAdvantage elite-status members may buy upgrades with AAdvantage miles at a rate of 35,000 miles for eight (8) upgrades, though I’d rather pay the $240 and save the miles for better value redemptions. Upgrades start clearing 72 hours before the flight and if it doesn’t clear at the window, it can be processed anytime up until departure. Non-elite members can also purchase and use 500-mile upgrades, but can only use them on full-fare economy tickets (Y & B). Non-elite status members can still upgrade from coach to business class by either buying 500-mile upgrades at $30 each or using miles and a cash copay. For most fares, an upgrade from coach to business class costs 15,000 miles and $75. Full fare economy (Y and B fare classes) to business only requires 5,000 miles. You can also upgrade from business to first class for 15,000 miles and $75 or only 5,000 miles if booked into full fare business class (J,D and R fare classes). Other Perks American has nicer Admirals Clubs (Flagship lounges) at JFK and LAX, and any ticketed business or first class passenger on an F or Z fare can access them, while travelers in business with J or U fares can also access the regular Admirals Club at these locations and at SFO. American also offers Flagship check-in for first class (on 3 cabin flights) and Concierge Key members at Los Angeles and Miami.